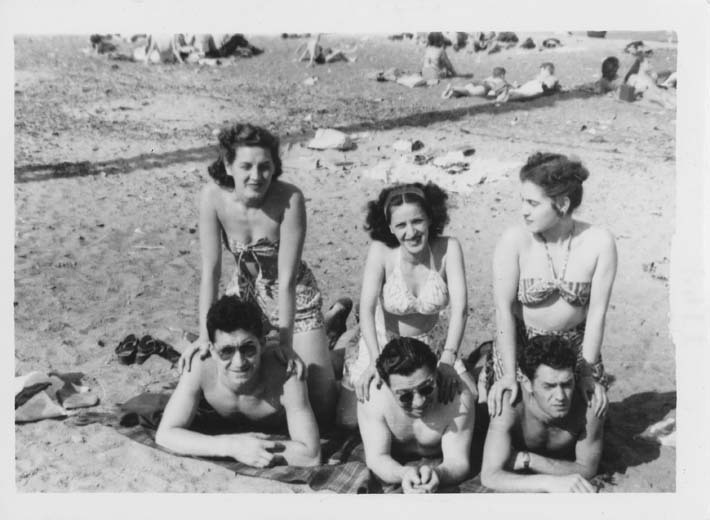 This is a black and white snapshot of Antoinette (Toni) Ciccarelli and husband, Patrick, with friends at the beach. There are three men and three women in the picture. The men are lying on their stomachs on a plaid blanket. The women are sitting on the men's backs with their hands on the men's shoulders. Toni and her husband, Pasqaule (Pat) are the couple in the middle. Everyone is smiling and staring straight into the camera except for the couple on the right. The women are wearing two piece swimwear with patterns and the men are shirtless and likely wearing swimtrunks. The setting shows a sandy beach with groups of people sunbathing in far background.